jewelry heist | All About Jewelry! Recently, there has been a constant wave of jewelry heists. Most recently, police have been searching for a group of thieves who made off with more than $100,000 worth of jewelry in a brazen smash-and-grab robbery at a Kay Jewelers in Livermore, Calif. Despite the fact that much of the robbery has been caught on surveillance video, the police have not been able to identify the thieves, who got in and out of the store in only four minutes early Monday morning and are still on the loose. Surveillance video released by the Livermore Police Department shows the three suspects crashing a vehicle through metal security doors at Kay Jewelers in the recently opened Livermore Premium Outlets. 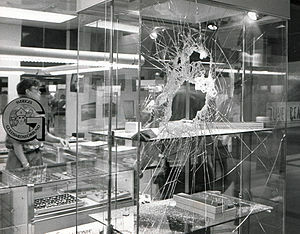 The footage also shows the masked and hooded thieves storming through the jewelry store, smashing open display cases with sledge hammers and taking as much merchandize as they could get their hands on in the short time. “They tried to open several cases, and took whatever they could,” Livermore Police Department’s Lt. Mike Trudeau said. Within four minutes the robbers had looted the store and were well on their way. Mall security, which is located on the opposite end of the building, arrived on the scene just as the thieves were making their getaway, and were only able to give a description of the vehicles, the police spokesman said. Trudeau declined to comment on other specifics regarding the on-going investigation.